zane on photoshop.com, a photo by hep on Flickr. 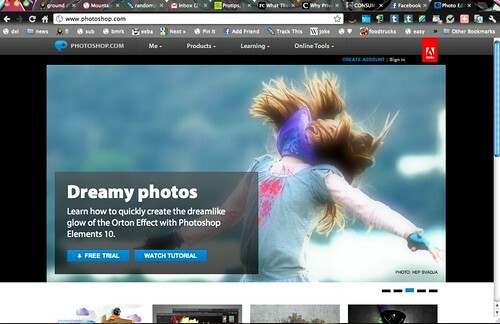 my photo of zane on photoshop.com today! thanks you! it's funny because i shot it for something completely different (as we live on a mountain, you can do those "jumping/flying" photos, and it looks SUPER real cuz you are so far up. so we were doing this "zane flying" series for fun on our hiking trips and stuff) and they ended up loving it last time i sold a photography stock batch to them. proof that you should shoot EVERYTHING ALL THE TIME because you never know what will happen! i know a bunch of amateur photogs this happened to with the flickr/getty photography stock program too. some guy shot a swimmer in a pool, and it ended up being sold to getty and used in a major ad campaign! It really is an insanely beautiful photo. oh they do! adobe is one of my regular clients, definitely not thieving off flickr. hehe you are the best! no, i take it as an honor that i have friends looking out for me! So cool! :D That photo is awesome.